I mentioned in my very first muffin post that I love to make muffins and my kids love to eat muffins. I make a lot of muffins out of the ingredients that I have in my kitchen, especially from my CSA farm share. Since I've been so eager to share other recipes, however, I've got quite a backlog of muffin recipes to share. So to work on this mass of muffin-ness, I'm starting an occasional (read, not weekly like Friday Night Pizza Night) series of Monday Muffin recipes. I've got sweet muffin recipes, savory muffin recipes, and strange but good muffin recipes (Beet and Horseradish, anyone?). I can pretty well say that they will involve less sugar and fat, and more whole grains than your standard bakery muffins. And they will taste terrific. Let's get started with a tasty winter treat! These muffins sound like they are decadent, but really they're not that out there. They are a morph of my Apple Cider Oatmeal Forgot-the-Sugar Muffins, so they can't be too unhealthy for ya, but with the chocolate and cherry additions they are a step above. 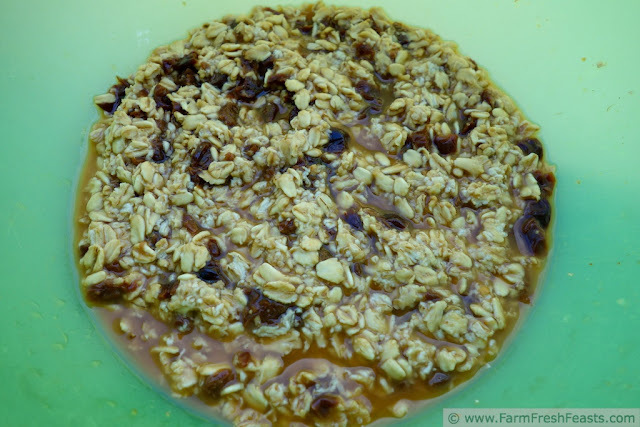 Note: I let the cherry-cider-oat mixture hang out on my counter for about 4 hours until the cherries were pretty hydrated and the oats were fully . . . soaked. I recommend at least 1 hour and up to overnight. These muffins are easy to throw together and forget about for a while, perfect for any busy time. In a large bowl combine oats, cider, and cherries. Let sit (see Note above). When you're ready to bake, preheat oven to 400 degrees Fahrenheit and spray a muffin pan with oil or the spray of your choice. Whisk in eggs and oil to the oat mixture. Dump dry ingredients on top then stir. Add chocolate chips and stir until combined. Scoop** into prepared muffin tin. Bake 15 minutes. Best warm but also good the next day. These also freeze well. The other day I introduced a new Recipe Index that way -----> . . . and now I'd like to introduce a gadget on the other side <------- . Please feel free to Follow Me. And, in the comments, please please please tell me what that means, since I have no idea! Thanks! This post is linked with Taste and Tell Thursdays and Food on Friday. These sound really good! I should have put some cider in the freezer this fall... since cider season seems so far away, do you think I'd have any luck subbing apple juice for it? Where did my reply go? My bad for not putting this recipe up when cider was in season. Apple juice will definitely work as a substitute. So I only have hard cider in my fridge right now, which might make an interesting candidate for Laura's Strange But Good. I don't really know what following someone does either (is that different than the email subscription), but I'd follow you anywhere. At least I know you'd feed me. 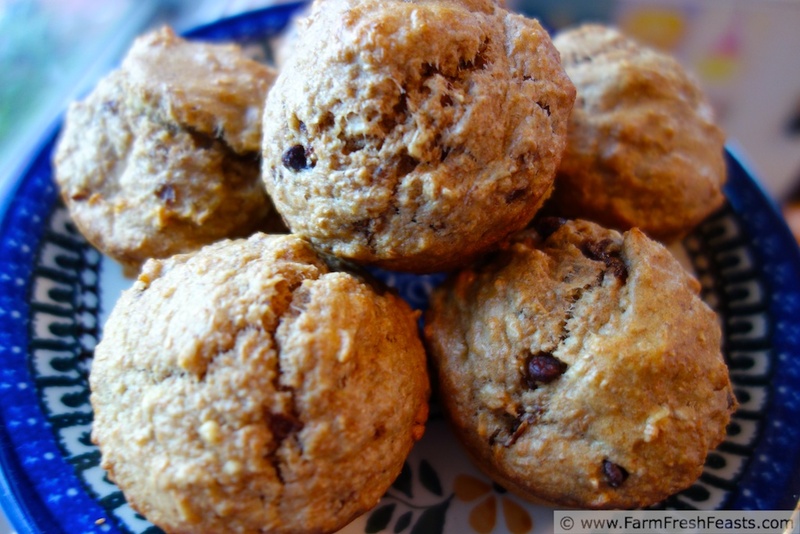 I'd like to suggest you make these muffins with hard cider, but if it were me I'd drink the hard cider and make muffins with buttermilk instead. I would think the jug from Meijer would be perfect. It seems like a waste of the rawness of raw apple cider to bake with it, you know? Please put the muffins out of their misery and bake them! I love this recipe. I will be the first one to admit I don't have much patience in the kitchen waiting for something to soak up or over night. I don't know why though. ha. I don't know if it's patience or just the desire to do 2 minutes of effort (when I've got 5 minutes to spare) with greater reward later. Like cookie dough. It's no big whup to mix up a batch of cookie dough, but much more . . . whup . . . to mix up a batch AND then bake the cookies in my opinion. So I'm happy to throw together the dough one day, and make the cookies another day. The dough is happier, too! This reminds me to toss together a cup of oats and a cup of buttermilk tonight for the kids' breakfast tomorrow. A muffin to be flavored later . . . gives me time to think. This sounds good and like a perfect treat to bake and keep in the freezer for last minute snacks! I seriously adore muffins. I need to try this! Once you try the 'soak oats in something' method, it makes it hard to go back to regular muffins. Mmmm, I think that chocolate and cherry is one of my favorite combinations, so I know that I'd love these muffins. They look + sound fantastic! I throw chocolate chips in all sorts of muffins (I love how a 1/4 cup of mini chips can flavor a whole dozen muffins!) and I think my pantry stash of dried cherries is multiplying--I cannot use them up! So this combination really worked well for us. Muffins, pizza, your soup . . . is there anything we can't stick dried cherries into? I loooove dried cherries. What a great way to use them! I merely like dried cherries, but I have a massive amount of them, so I'm learning to love them until I can use them all up! I really love the ingredient list here! Me, too! Now I'm making Double Chocolate Raspberry muffins--even yummier! I adore muffins and could eat them every day of the week! These look wonderful. Thanks so much for sharing at Taste and Tell Thursdays! My kids could eat muffins every school day, if their mother would wake up early enough to get her act together! WOW and then WoW again! Chocolate and cherries are one of my fave combos and as an excuse to eat for breakfast?? YES! Thanks for sharing!